The Prestige Cruises Buffet Deal - Was it worth it? Early last year, a couple of online group buying sites started popping out of nowhere. It started leaving me and a thousand others glued on to our monitors for another great buy to pop out. What's there to lose from these deals, right? Well, there have been a lot of great discounts... or so I kept telling myself. But then I realized that these money-saving tactics weren't much of a saving-approach for me. So I stopped purchasing late last year (well, that's just me). Ok so last July, a hard-to-pass-up deal was posted online; and it was sold on Metrodeal.com. Since they were only selling each voucher for P250 per person, I immediately got my credit card for a quick purchase. I then paid for P1,000 worth of vouchers. This deal may have become a disappointment for a lot of bloggers, as some of them felt ripped off. But for me (since I did some more research on my own), the damages that were incurred from this purchase was less dramatic on my end. I'm actually grateful to some of the bloggers that I've read from for the head's up on this particular deal. Moving forward, if you haven't used your vouchers yet, I suggest that you have those booked before it expires. It'll still be worth your time. Anyway, here are a few useful tips that may help you appreciate more of the P250 deal that you got or will get online. 1. Prestige Cruises responded to my emails and SMS. But it took them a while to respond. However, they made up for their shortcomings by sending me reminders (via sms) about registering early for our cruise. I scheduled mine on a Thursday, at 8 PM then (to accommodate my cousins who were coming home from work). So we were only allowed to register between 7 - 7:45 PM. My advice - go there early. If you can make it before 7, do so. Now, guests were called into the ship on a first-come first-serve basis. We registered early, so we also got to board the ship when it started welcoming passengers. And by also being early, we had the luxury to pick out our table without having to compete for it from anyone. 2. It's also best to dine nearest the buffet table. I was actually able to read this from one of the blogs that I was following. It noted that it would be made to your advantage if you stayed on the first floor deck. Now, the caterer's will not announce that they're about to open their buffet table. So pay close attention. We were actually surprised when a group of people just started lining up for the food. But since we were close by, we were able to get into the queue area. Now, the people who were seated on the 2nd floor had to wait on the long line. It was past dinner time, so I was sure everybody was already hungry and grumpy. I actually felt bad for the people who were still standing and waiting to be served, while every guest that were seated on the first floor already started eating. 3. Take as much food as you can. But don't be a glutton. And if the queue area's not too long anymore, go for seconds. As for me, I only got what I thought I could finish. I got a cup full of rice (which I had the liberty of scooping myself), a bowl of hot mushroom soup, two pork or beef entrees (I vaguely recall what I ate since the waiters were too busy to be asked any questions), some buttered corn & carrots, and a bowl of taco vinaigrette salad. Also, canned drinks were sold for P75 each (water will not be served for free neither is the wine-filled glasses on the photo that was posted on the ad). So prepare P50, should you decide to bring in your own drinks. Now, in my opinion, their P250 buffet meal could've offered more than that. Then again, it's P250. 4. 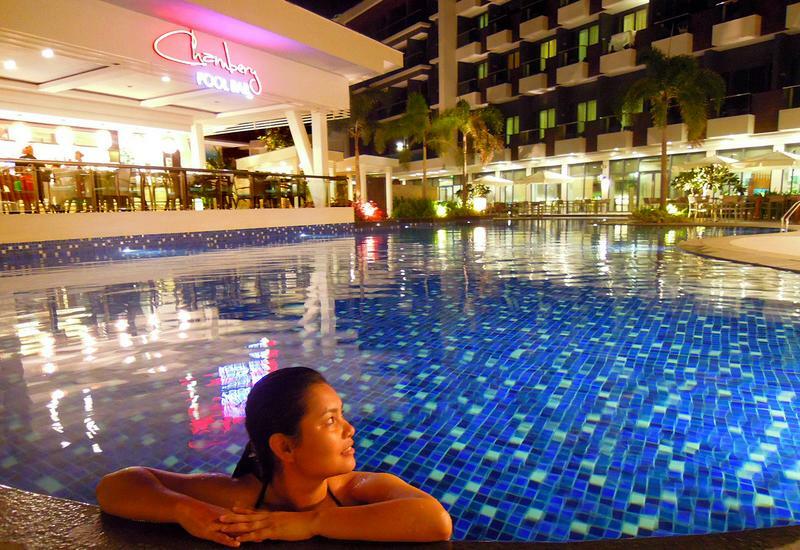 Sit anywhere, but the best view at night is on the first floor. The first floor felt more spacious. 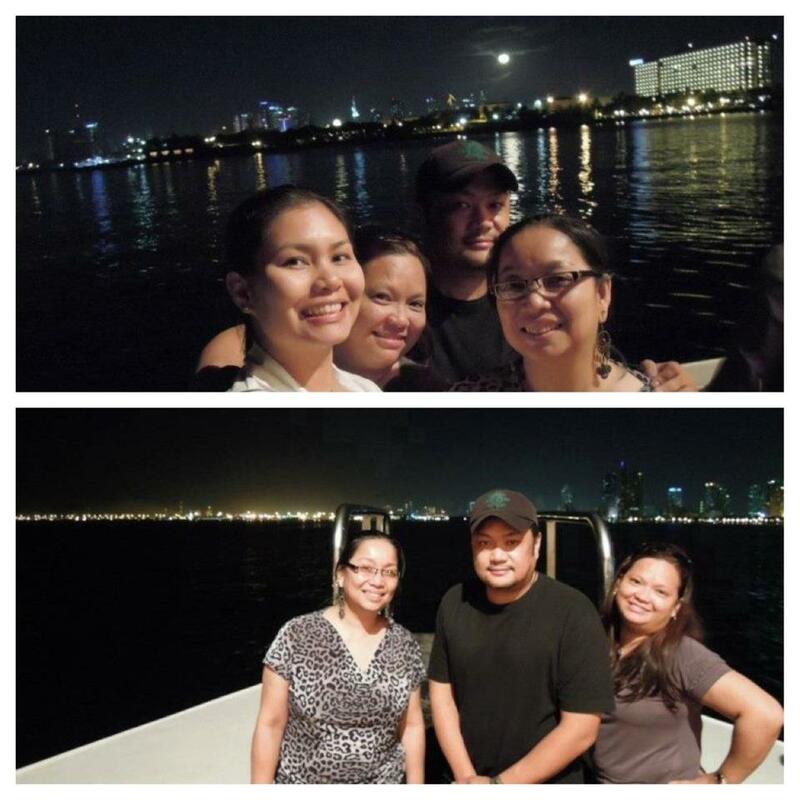 Although there wasn't much to see, the city lights were there to accompany us on our 1-hour trip. The moon was also at its brightest, and the MOA eye was also in sight. Ok, so I used these vouchers to treat my kuya for his birthday (pre-birthday that is). And I was actually surprised that he and my two older Ate's enjoyed the cruise. The ship was actually old. The monoblock tables and chairs weren't that presentable either (they should improve this if they intend to attract the AB class), and the buffet wasn't actually a buffet. They should've just plated our meals since they served it to us in very measured portions. But what helped balance this experience was the cool breeze and the nice weather. The night lights from the city were lovely as well. But the best part of the cruise was having my loved ones there. Anyway, the deal may have been misleading for the 40,490 people who paid for the cruise. I would have probably ranted greatly about it too like the others. But I chose to see the good side of it still. I learned my lesson from this kind of deals online. And if something is too good to be true. Then it probably is. It's simply learning how to choose our battles. And by doing so, it made my night out with my family more meaningful, than disappointing. Something I'd like to try in the future. I'm sure it's a nice experience. It was a nice experience naman. All the more kasi I was prepared of what was about to happen. =) It pays to do your research talaga. Yes, try Ebay Kuponan rin pala! =) They also have a good purchase system. Nice tips and these apply to all buffet promos, I guess. :) Haven't tried any dining deal from group buying sites. For me, spending time on a yacht would be one of the most memorable moments in my life. Hey Herbert! Honestly, di sha ganon kagandang yacht. Luma na ata, na parang di mashado naMi-maintain. =( Sayang actually. seriously? I am about to contact them , i thought mas maganda sya kesa sa suncruise Manila bay suncruise. Hey Chino! 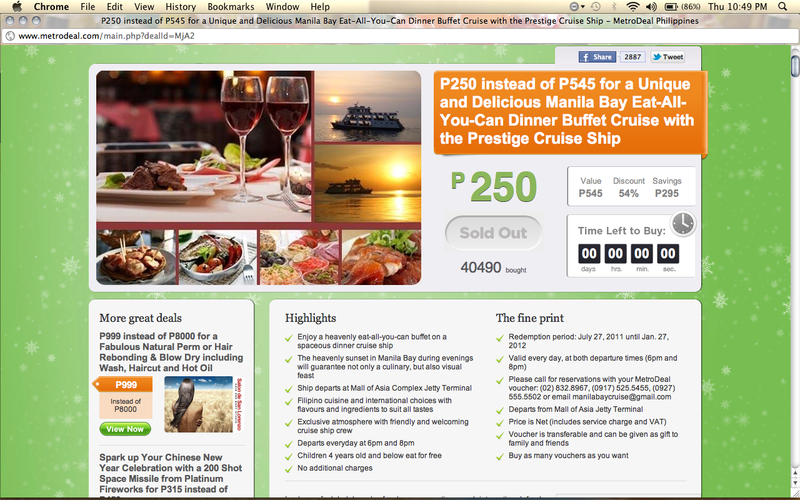 Malay mo naman ok sa Sun Cruise? =) Only the exterior of the Prestige Cruises yacht looks nice. Pero their chairs, tables, are just of monobloc material. I guess it was just a matter of picking a nicer spot that was near the "buffet table" kaya nagBenefit pa din kami sa purchase namin kahit papaano. But if I were to see the same deal online, I definitely won't buy na. I thought you'd report that there was a scam in MetroDeal as some buyers had experienced being fooled and they could not refund their money anymore. You got my ineterest, I want a dinner on a ship too. Hope I can have a good time like you. I checked the date, old post pala. I hope some they improved their services now the cruise ship and metrodeal if they are still in business after a year. You are a very loving sister. Ang sarap maging Kuya mo :) Anyways, good for you that you look on the positive side of the incident. Actually, it helps because by doing so you make the event a memorable experience. Deals like that always have this hidden charge or agenda. Good thing you aren't affected that much of this kind of marketing gimmicks and you truly enjoyed your trip. Great tips sis. Hope everyone who had this voucher will experience the same thing just like what you've experienced here. The truth is... I never tried to purchase or get deals online. I've been reading a lot of blog posts about these discount vouchers but I'm having second thoughts. I don't know how to recognize a legitimate ad. I just hope, this unpleasant incident will not happen again. Are you ready to do some shopping via great online deals? Welcome to shoptayo.com, find the best deals for fashion & accessories, beauty, food and drinks, travel, gadgets, spa, restaurants and much more. Get the finest deals from the Philippines at one stop, and grab your chance to explore the best. Budget Biyahera LOVES Bohol Bee Farm! Dumaluan - An exquisite beach in Bohol!